Across to Pico Peak and down to Kent Pond. Up this high you’re standing on top of the world. The Gondola got us close to Killington’s 4,235 foot summit. A well worn goat trail took us the rest of the way. 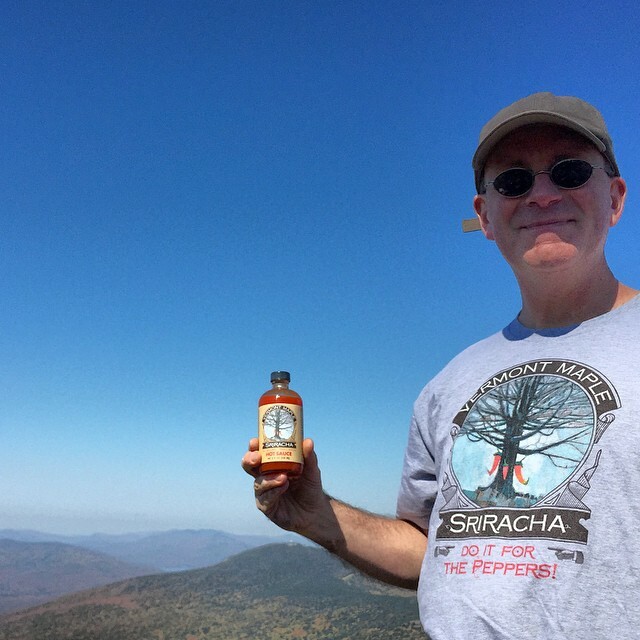 This video was sponsored by Vermont Maple Sriracha. Well not really sponsored, but sort of fueled by it. I put it on everything I eat. You are invited to cast your vote here for this home grown Vermont product in Martha Stewart’s American Made contest. Good luck Big Lenny and Jackson! I’ll be announcing our free print winner for October next Monday. Until then, enjoy the fall colors! Thanks Myra, I tried to look young and fit for the video, but I was huffing and puffing lugging all that gear. Alas, it was well worth it! Neat picture. Great view. Nice Fall colors. I miss the colors, they are not the same here in Georgia. They are drabber. Yes David, Vermont has Georgia beat in a couple of ways, fall foliage being one for sure. Traffic, at least Atlanta traffic, is another. Thanks! Inspired by your gift, your keen eye and your willingness to share your process with us far and wide. Always a pleasure to watch you work and to see the outcome. Thanks Peter! Vermont at its best..! Well done. Indeed Mike, we were there together. Thanks for all the support! 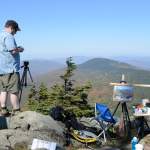 What a beautiful video of the making of a beautiful painting on such a glorious fall day! Many thanks to my webmaster, friend, and Sriracha meister Jackson Whelan for this excellent video. He’s a genuine artist! 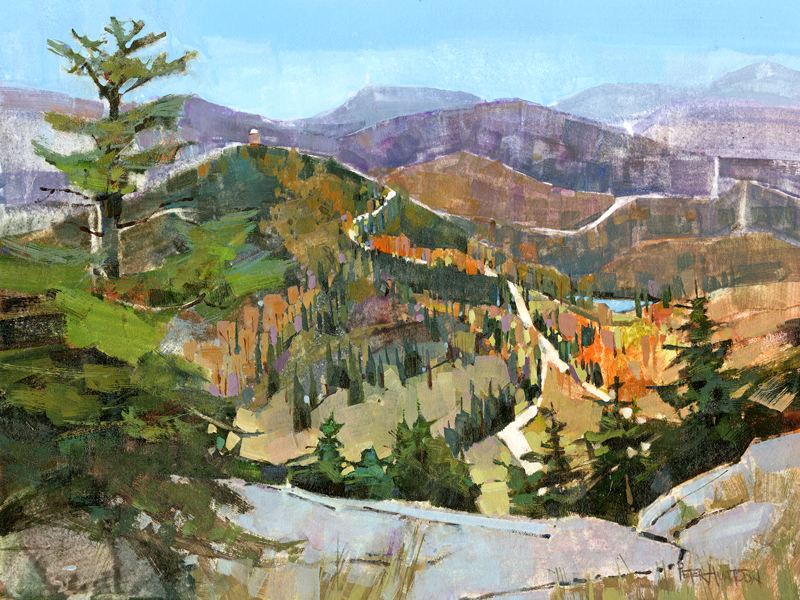 I love how you share Vermont’s beauty and your art! The videos are so much fun and inspiring. Thank you! Wish I could live in Vermont! With enthusiasm like that Susan, we wish you could live here too. My pleasure, and thanks! Great memories of where I learned to ski as a youngster. Once again Peter you have captured it! Job well done! Ski? I was nervous walking up there. I can’t imaging sliding around on skis on that precipice. Thanks Chris! 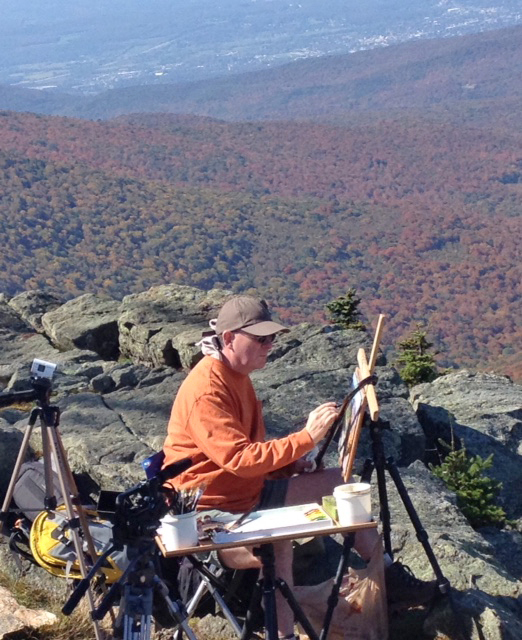 As an ex-Vermonter living in Colorado, I am especially enjoying seeing your fall foliage work. Thanks Deborah, glad you are enjoying it! At least you can get good green chile out there. We rode the gondola on Friday and gazed in awe at the gorgeous sight. And you captured it with your paints! What joy to be able to do that and share it with us. Thanks again! Thanks so much for your continued support Muriel! You know that I try to make it look easy, but truth is there are almost always moments of arduous struggle in a painting. And that makes the occasional successes that much more satisfying. Thanks Sukie, this was a blast to paint for sure. Nature’s color palette is something to behold. I like your work. We just got the pamphlet that comes when you buy a new Subaru and voila`! There you were. We’re related to a bunch of Huntoons. THey’re out here in Oregon now but Uncle Joe was a son of Ralph Huntoon from New Hampshire somewhere. Small world! Keep up the good work. I grew up in Rutland but have lived in NH for the past 30 years. I have always loved your artwork but this most recent painting has to be my favorite. Thank you for sharing your incredible gift! Thanks Katherine, once a Vermonter…always a Vermonter. If you grew up in Rutland, maybe you recall the State Cut Rate on Pine/State St. That is where my dad worked and we lived next door. I saw the article in drive magazine. I am impress at what u do, traveling throughout. Vermont capturing the amazing view. I enjoy your paintings, thank you. Thank you Consuelo, a fellow Subaru driver! You can’t get much closer to heaven in this neck of the woods than standing atop Killington at this time of year. Watched the sun set up there tonight…and the moon rise. Perfection! I couldn’t agree more, Barb. Next time I’ll have to plan on a sunset/moonrise. That must have been incredible! thank-you so much for allowing me to feel a part of your painting experience! I live in PA but had the opportunity to return to VT. this past Dec. It is one of the most beautiful trips to make. Your painting turned out to be wonderfully inspiring. The video and music are superb… shared on FB. Thank-you again! Glad to have you along for the adventure Pat. Believe it or not it inspires me to do my best when I know I have a couple of thousand friends looking over my shoulder when I paint. Make me rise to the occasion because how could I let you down? Your videos are always inspiring. 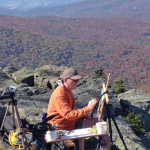 I do have a technical question…although it may relate to your climb….I’m curious why you do not use an umbrella and instead let the sun hit both your piece and palette? Also, you use WC transparently and opaquely, but I see white on your palette. Is that gouache? If yes, does it contaminate your other WC pigments? I’m wondering how you keep them separated, unless you use a different palette. Thank you for sharing your artistry! I now live in Florida and I really miss the colors of fall. Thanks Karen, yes I do have an umbrella in the car but rarely use it. I prefer to seek out shade to paint from if possible. Not knowing what the top looked like, I opted to leave the extra weight in the car. 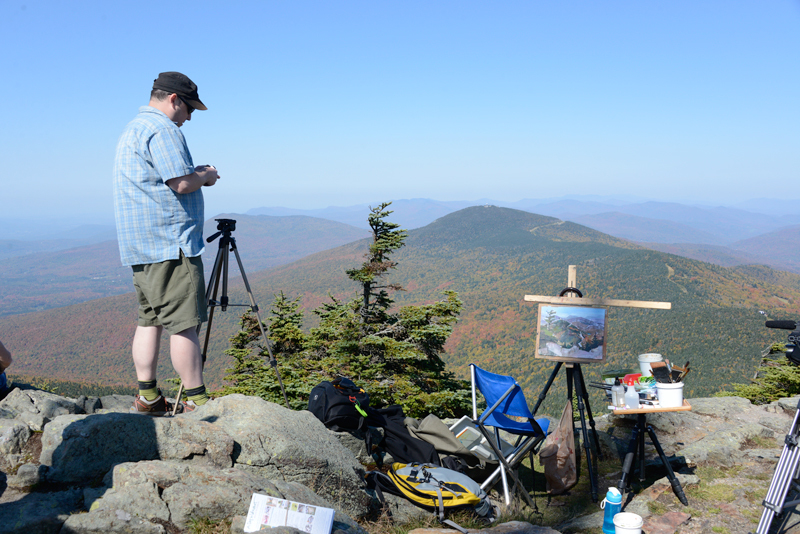 Painting for short periods ( 1hour +/-) in direct sun is not so bad, at least here in VT, especially in the fall. Don’t know about Fla. The important thing is to have the SAME light on your canvas and palette. Yes, the white on my palette is simply white gouache. I don’t really separate the opaque gouache from the transparent watercolors. Rather, I strategically integrate them! And that’s where the “art” lies. Having areas of transparency, opacity, and transitional translucency gives the painting just one more element of visual quality and interest. Awesome video. Made that trek many times. Fascinating to see the view selected, and then captured, by your artist’s eye. Best wishes to you for MANY more a’fond voyage’ in the green mountains and beyond! Thanks so much for your big support Mike, and yes, I too look forward to many more artistic adventures together. Every journey is better when you’re with good friends! Creating the art is only half the fun. Sharing it with others is the other. Thanks very much Barb! What a hoot: to watch you climb with anticipation, to paint with with joy, and to decend with the sense of pride. Yes, there were a few artist at work, you and the video person. Must be such fun , the energy shows. Thank you Lisa, really glad you enjoyed it. Knowing we are making a few people like you smile…That makes everything we put into it worth it.